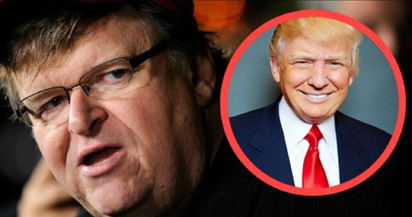 Michael Moore's Michael Moore in Trumpland is, without question, biased toward Hillary Clinton. Heck, all throughout it, Moore explicitly tells us to vote for her in the upcoming presidential election. But what's interesting is that the film's lasting impression is not that of overt partiality toward one politician but rather genuine, solemn affection for the United States and Moore's hopes for improving it. This is why Michael Moore in Trumpland works as a movie and not merely as pro-Clinton/anti-Trump propaganda, although it fits snuggly into that category too. In it, Moore puts on a one-man show at The Murphy Theater in Wilmington, Ohio (birthplace of the banana split) and pleads his case for why he thinks Hillary Clinton is the better, more qualified person to lead our country and, hopefully, enhance the world. The fact that we listen to Moore not only tells us he's s a gifted rhetorician but that he also has something worth saying, which, in turn, makes the movie worth seeing. Yes, this goes for avid supporters of Donald Trump and/or haters of Michael Moore, too, because, deep down, we all know it's right to hear both sides of an argument, and Moore, an outspoken liberal, simply presents one aspect of the left side with earnestness, pragmatism and frivolity. He's neither bullying nor hostile, and even though he doesn't hesitate to take silly jabs at Donald Trump and company, he doesn't go overboard. For the most part, he's harmless and just wants members of his audience, which is comprised of people from all sides of the political spectrum but mostly those who are on the fence, to hear him out. His hope is that, by the end, the undecided will join Team Hillary.